The large infinity swimming pool and stunning panoramic views over the south coast of the island make Villa Orchidea a great choice. The same superb scenery can be enjoyed from the living area and all 4 en suite bedrooms. Plus, Katelios Beach is only a mile away and a choice of shops and restaurants can also be found nearby. Pool heating, air conditioning/heating in the bedrooms and lounge and WiFi are included. It has to be that incredible view. With scenery like that you won't want to leave the villa! Outside, Villa Orchidea has a fantastic private swimming pool which is infinity style so as not to obscure the superb hillside and sea views. The large terrace provides plenty of space to bask in the sun and there is also a comfy seating area with wicker seats, ideal for relaxing with a cool drink and soaking up the scenery. The exterior dining area is shaded from the sun and is complimented by a brick BBQ to one side of the house. The patio area is enclosed with wrought iron railings and bordered with trees for a good deal of privacy. The villa shares a private driveway with sister villa, Thymari, and parking is directly below the house. Steps lead up from the parking area to the side of the villa where you will find the main entrance. This villa has a spacious open plan living area with large windows along one wall framing the fantastic views, and patio doors onto the pool terrace. There are comfy sofas around the flat screen TV, an ornamental fireplace, a dining table and chairs and a fully equipped kitchen with all mod cons to make dining easy. On the ground floor are 2 twin bedrooms, each with an en suite shower room. The twin bedroom at the front of the villa has patio doors onto the pool terrace. An impressive marble staircase from the living area leads to the double bedroom on the first floor. One double bedroom has an en suite bathroom and patio doors opening onto a small balcony with stunning views of the surrounding countryside and across to the turtle beach. The second double bedroom has a small dressing area with fitted wardrobes and an en suite shower room with a double walk in shower and marble vanity units with twin basins. Patio doors open onto a larger balcony with panoramic views of the whole area. All the doors and windows are fitted with sliding fly screens. This villa is registered and licenced by EOT Greek licensing association. This number is: 0830K10000823801. 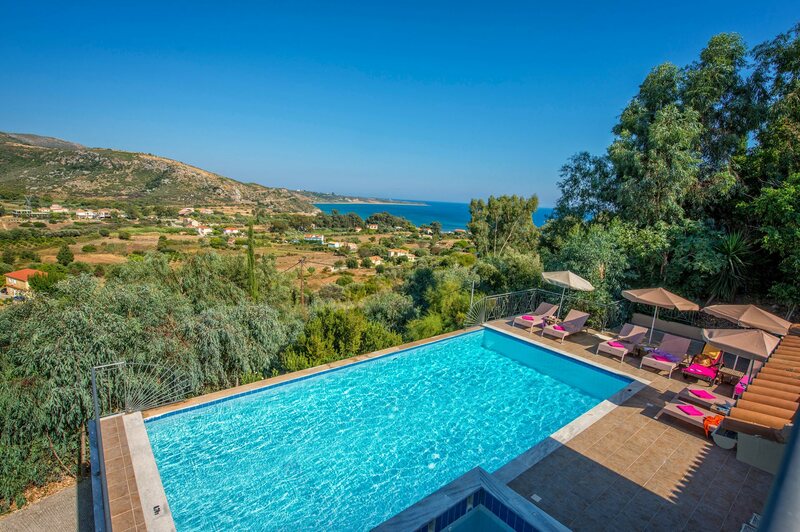 Located on the hillside above the tranquil resort of Katelios, Villa Orchidea has fabulous views over the Southern coast of the island and sea. The resort of Katelios is famous for its fresh fish tavernas and its picturesque beach, all within a short drive from your holiday villa. For anyone wanting to see more of what this beautiful Greek island has to offer, the resort of Skala and capital, Argostoli, can easily be reached by car. Originally a quiet fishing village, Katelios is slowly developing and has a choice of small mini markets and shops where you can pick up fresh produce to cook up on your own BBQ. A larger supermarket is within a short drive. The resort has a small selection of excellent tavernas. For a larger selection, venture into Skala which has a great choice of places to eat lining the beach. The area has a large selection of bars, tavernas and restaurants as well as several large mini markets and an ATM. The beautiful beach at Katelios is within a few minutes' drive. The area is also home to the environmental centre where a group of volunteers aim to protect the turtle nesting ground in nearby Mounda Bay. The larger, more developed resort of Skala, with its long sand and shingle beach, is about 4 miles along the coast. Argostoli, the capital of Kefalonia, is 20 miles to the West of Katelios and is well worth a visit, not only for the choice of facilities here but also for the beautiful scenery. Other attractions in the area include Agios Giorgios Castle, around 30 minutes' drive North towards Peratata, Agios Gerasimos Monastery around 40 minutes away by car, and the Melissani and Drogarati Caves, an hour North in Karavomilos. Motor boat hire is available from the small marina at Katelios. Or a choice of watersports can be found on the beach at Skala. Villa Orchidea is not available to book for season as it is sold out. Take a look here at the Kefalonia villas that are currently on sale. A large comfortable family villa with amazing views from every angle. This is our second visit to Villa Orchidea and definitely wont be our last! The whole holiday was 10/10 could not ask for any more than that. An extremely well appointed and comfortable villa, with spectacular views. An ideal base from which to explore this breathtaking island. Good location, great views, well appointed.